What is the difference between a Dental Technician and a Dental Prosthetist? Dental Prosthetists are primary healthcare professionals who are qualified Dental Technicians and have completed further dental studies in order to have direct patient contact for the construction and maintenance of removable prosthetic appliances and sports mouthguards. A Dental Technician is not licenced to take impression or work in a patient’s mouth. Dental Prosthetists have either an Advanced Diploma in Dental Prosthetics or a Bachelor of Oral Health in Dental Prosthetics. They can work independently as the owner/operator of a denture clinic to assess, design, construct, fit and adjust removable dentures and sports mouthguard service to the public without a referral from a dentist. A Dental Prosthetists clinical role is focused on diagnostic, preventive and fabrication duties to provide a complete removable prosthetic service for the replacement and protection of natural teeth. Why would I want a denture in the first place? There are many reasons why people need dentures both functionally and cosmetically. Difficulty with eating can be debilitating. It requires close attention because it can cause digestion problems. Your smile, too is vital to your overall well-being. You can smile and be confident that that you are presenting a good impression if you have good-looking teeth. A good set of dentures can go a long way to restoring your appearance and consequently your self-confidence. 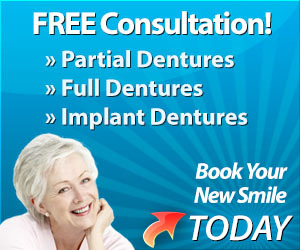 Your first denture will not be your last. A lot of people think a denture should last forever, but this is, unfortunately, just not possible. Dentures can be worn down by incorrect maintenance. The mouth and gums will also change in shape, but the denture does not. The supporting tissues of our gums are actually changing all the time, so the denture should be inspected on a regular basis. Can I wear them overnight? This is generally up to you. Continuous pressure on the denture can cause a number of problems, so if you tend to grind your teeth while sleeping, it is probably not a good idea. On the other hand, if you take them out and find that you are waking up with facial muscle discomfort, it may mean you are over-closing your jaws. Under that circumstance, it may be better to leave them in. How can I clean my denture? Both natural teeth and dentures need to be cleaned regularly. Most of us are aware of the “brush after every meal” ideal, but, because of location or time constraints, we often find difficulty with this. Toothpaste was designed for natural teeth and it does a tremendous job for natural teeth. However, the reasons that make it good for natural teeth, also make it inappropriate for the highly polished plastics that make up most dentures. Using a soft toothbrush, hold one side with your fingers, and brush gently, using a liquid soap or a bath soap. Rinse them carefully after cleaning. Brushing too vigorously may also result in unnecessary wear and tear on the base. Dentures are designed with a lot of strength for chewing, but not for bending. Do not place a denture in the palm of your hand. They are actually quite fragile and can snap at their weakest points without careful handling. Actually, most dentures are broken when they are being cleaned. One tip when cleaning dentures: put some water into the basin and clean them over the water. If you drop the denture, it will fall into the water, cushioning the fall. Perhaps the place where people most frequently break their dentures is in the shower, so please, do not clean them in the shower. My first denture is uncomfortable. Like with anything new, it takes a little time to get used to your first denture. It feels bulky in the mouth, and there is a temptation to play with it all the time with your tongue. It may take a little while to develop new chewing techniques, which can also be discomforting. With time and a little patience, you will overcome these difficulties and adjust to your new denture.